Spool of Ribbon has all the ribbon you could imagine! They offer flat rate shipping at $6.95 or free shipping on orders over $49. You can also use the code "SMEDAY20" at checkout to get 20% off your entire order through July 31st. It's Kimbo from A Girl and a Glue Gun's birthday, and Someday Crafts is helping her celebrate by giving away a box full of *MY* favorite things! 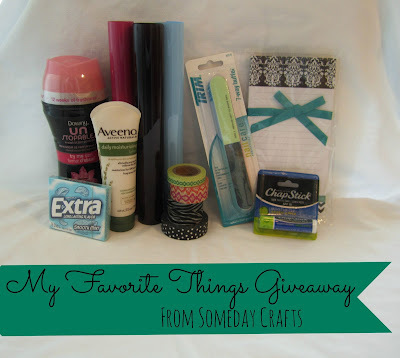 Go get entered to win! 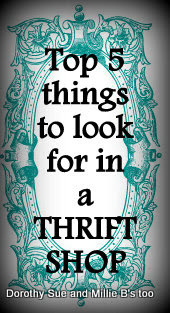 Dorothy Sue and Millie B's too wrote about the Top 5 things to look for in a Thrift Shop. I've always wandered around thrift stores, but usually come up empty handed because I'm unsure of an item's potential. Now, I might be able to come home with some treasures! Also, this Friday we'll be opening our Back to School Categorically Crafting Party. Be sure to come back throughout the next month or so and link up your back to school projects! Thanks for hosting another inspiring party. Have a wonderful week!! Thank you for featuring me this week and thank you for hosting such a great party! Thanks so much for hosting your party! Hope you have a nice week! Thanks so much for the great party! Hope your summer is going well. Have a great day! Loved the thrift store feature. Thanks! I love going "treasure hunting" at thrift stores. I'm co hosting Tasty Tuesdays this week and would love you to stop by with your links. I learned about your link party from Nancy at Skinny Kitchen. Thanks so much for hosting! What a great collection of creativity!